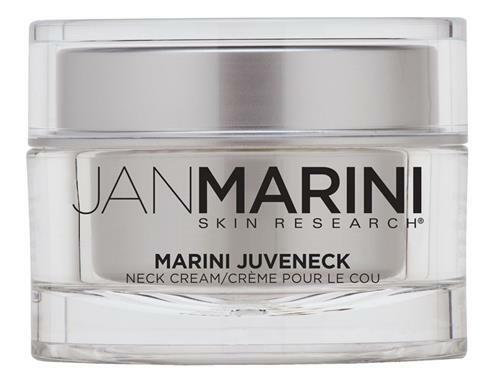 Hydrate, tighten and firm a sagging neck with Jan Marini Marini Juveneck. This ultra-rich neck cream is specially formulated for the delicate neck area to smooth horizontal creases and deep wrinkles and rejuvenate skin for a lifted, youthful appearance. Peptides, DMAE and hyaluronic acid work together to boost collagen production, reduce crepiness and intensely hydrate skin on the neck, chest and jawline. In an independent study, over 94% of users said they noticed improved skin texture with smoother, softer skin after 3 months’ use. Tell us your thoughts about Jan Marini Marini Juveneck and receive 50 rewards points! I’m sure this is a very good product. It caused a rash and I can’t use it. I use Revision Nectifirm instead. I bought this product based on the reviews. I’m still using my first jar. It lasts a long time. It’s smooth and creamy without being heavy or greasy. I love my new product!!! Oh, how I hate turtlenecks. No more thanks to Juveneck. I am 35 and I believe the earlier you can start with good products the better. I have used Jan Marini for the last 3 years and I LOVE it! I get comments on my skin and neck all the time! I have used this on my neck for a few months and seeing some improvement, so I am not starting to use it on my chest! I love Jan Marini products. Bring this down onto your chest to help with the lines. Very thick cream. A little goes a long way. This is a good moisturizer, but does not deliver on the promise of reducing lines on the neck. I went through three jars before I gave up. I really like the cream and the jar is really big as well, so it will last a long time. I havent used it very long, but I am definitely seeing some tightening of the neck area! I am 57 years old and have been using this product for one week and love the results. There was a clear difference after just one day.. I highly recommend this product. As a cliff note, LovelySkin is the best site for you beauty care needs. The customer service is outstanding I have been a loyal customer for over 7 years. I have used so many products on my neck...all with the same results...nothing. However, this product has firmed my neck and softened the lines more than I ever expected. I am so thrilled with this JM product that I have ordered my second jar earlier than needed because I dont want to be without it! I HAVE USED THE PRODUCT FOR A SHORT TIME AND I CAN SEE A DIFFERENCE ALREADY. MY NECK LOOKS FIRMER WITHOUT THE TAUGHT FEELING OF BEING DRY AND STIFF. THIS IS A GOOD INVESTMENT. I THINK JUVENECK IS MY "NEW" BEST FRIEND! IT IS WORTH A TRY AND THE MONEY. This is THE BEST!!! Enough said!!! Dont buy other neck cream, dont waste your time and money, BUY THIS ONE!!! IT WORKS IMMEDIATELY even I find it hard to believe. This product has miracle ingredients that instantaneously give you the lift that you need. It works like non-surgical skin tightening procedure that you get at the doctors clinic yet only a fraction of the cost. BUY THIS.